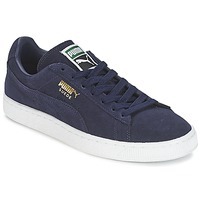 These Puma trainers are carefully constructed and built to last. A must-have shoe for the season. Undeniably the best known and most popular of all Puma shoes, this classic sports model is one of the craftsmen of the success of the German equipment manufacturer. An integral part of all street communities since the 1980s, Sweden has even participated in historical events of global importance. This one-colored version is embellished with a luxurious embossed graphic on a suede upper.